Taken from two luxurious state rooms on the Britannic, the wooden overlay will take centre stage at the two-day auction at the Heritage Hotel, Killenard, Co Laois, on May 1-2. Rediscovered after their use in a Dublin city centre cinema until 1972, the panelling from the first-class lounge and the second-class library are expected to sell for 200,000 euro each. Launched in 1914, two years after the ill-fated voyage of sister ship RMS Titanic, the HMHS Britannic was intended to be superior to her twin. However, during the First World War the ship was requisitioned as a hospital ship and saw the fittings removed. One year later, while on route to collect troops wounded in the Balkans campaign, the ship hit a mine laid by a German U-boat and sank in the Aegean Sea. The wreck lay at a depth of 400ft for 59 years until it was discovered by explorer Jacques Cousteau. The Britannic’s stored luxurious furniture and fittings were auctioned in Belfast in 1919 and ornate carved wood panelling from both the first-class lounge and second-class library were used to adorn the La Scala Theatre and Opera House in Dublin, which later became the Capitol Cinema. They remained in place until the building’s demolition in 1972, making way for what is now Penney’s, and the panelling was installed in a private residence near Dublin. 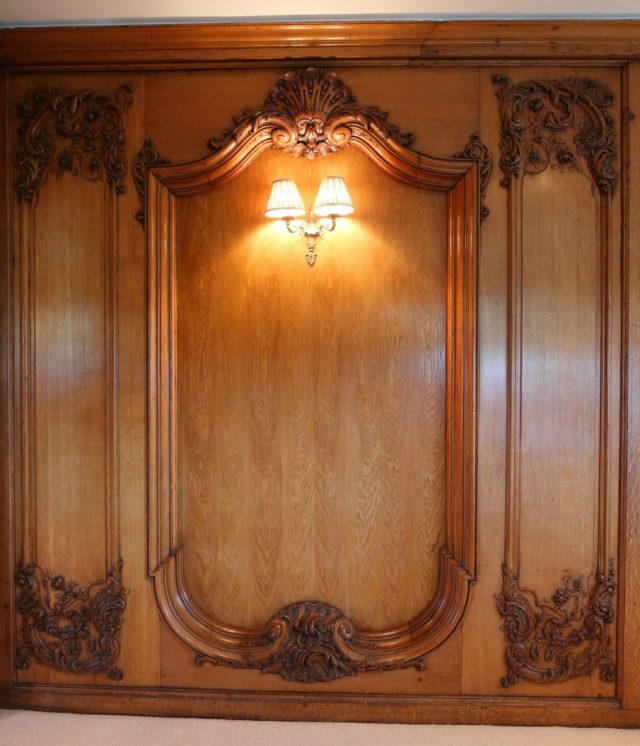 Manufactured by Harland and Wolff in Belfast, the panelling was carved to a design by Arthur Henry Durand which matches the fittings installed in the Titanic, and features the ship number and panelling number on the reverse of each piece. Durand also assisted in the design work on the Eiffel Tower. This is the latest of the signature auctions from Niall Mullen, who held the biggest auction in the history of the state – the 14-hour disposal of the contents of the Central Bank. “These pieces are identical to the designs used on the Titanic, and cannot be replicated, either for their historical value or their ornate craftsmanship. “They are a truly significant nautical find of world importance,” said Mr Mullen. “The first-class lounge panelling, framed in richly carved polished oak in a Louis XV style, has a guiding price of 250,000 to 350,000 euro. “The oak had been seasoned for at least 35 years before manufacture, dating it back at least to 1877. “The second-class library is panelled and framed in maple, handsomely carved in a Colonial Adams-style design, measures 25 metres squared, and has a guiding price of 200,000 to 300,000 euro. 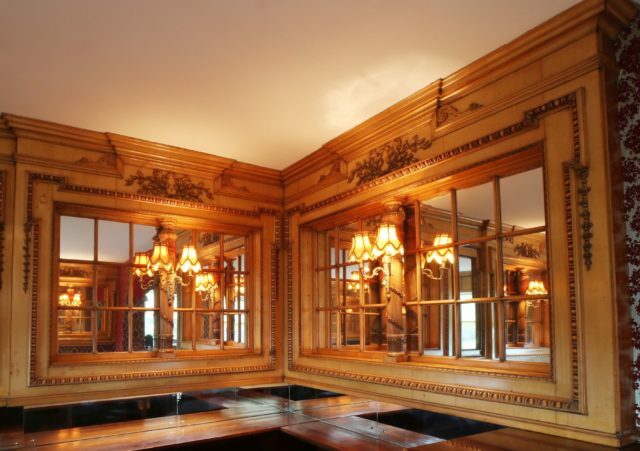 “The maple panelling is accompanied by a magnificent mahogany bar with copper embellishment. The two-day auction also features collections from some of Dublin’s most well-known hotels and entertainment venues. “Taking centre stage in the iconic stakes is the fanlight from the reception area at the Shelbourne Hotel,” Mr Mullen added. “We also have the original share register book from the Shelbourne as well as the documented records of the opening of the hotel’s cocktail bar in 1944. “There is also an amazing curiosity cabinet originally from Lissadell House. The auction will take place on May 1 and 2 at 11am. The auction catalogue will be available to view at victormeeauctions.ie or titanicsisterauction2019.com.